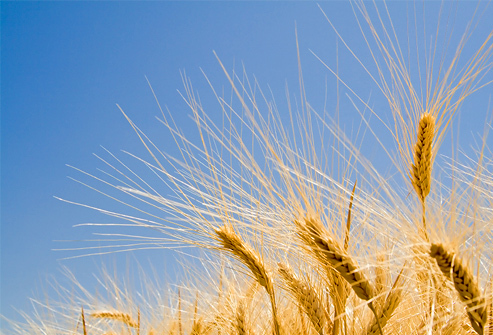 The Parable of the Wheat & Tares – Cole Matson, Ph.D.
Posted on July 28, 2012 by Cole Matson, Ph.D.
Darnel [Lolium temulentum, a.k.a., poison darnel or cockle] usually grows in the same production zones as wheat and is considered a weed. 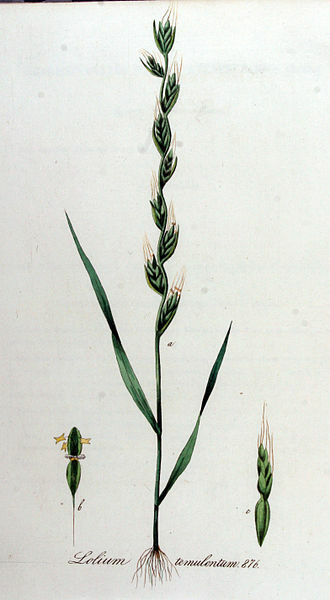 The similarity between these two plants is so extensive that in some regions, cockle is referred to as “false wheat”. It bears a close resemblance to wheat until the ear appears. The ears on the real wheat are so heavy it makes the entire plant droop downward, but L. temulentum, whose ears are light, stands up straight. The wheat will also appear brown when ripe, whereas the darnel is black. When the Lolium matures, the spikelets turn edgeways to the rachis, where the wheat spikelets remain as they grew previously. Jesus’ parable had more layers than I ever realised before. Instead of just being a parable about bad people being inextricably intertwined with the good people in the Church until the Judgement Day (the way this parable is usually explicated), the use of the word ‘darnel’ to translate ζιζάνια indicates that those who are destined for judgement, as the darnel is collected and burned, are almost indistinguishable in exterior appearance from those who are destined to be saved and gathered into the Father’s barn. Not only that, but the darnel looks nourishing, but is actually poisonous, and can cause death. Therefore, it is destined for death. 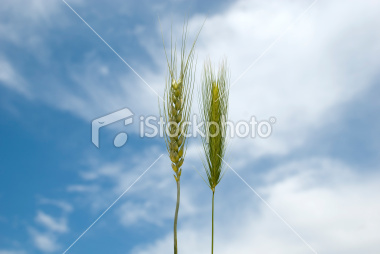 The similarity between these two plants is so extensive that in some regions, cockle is referred to as “false wheat”. It bears a close resemblance to wheat until the ear appears. False discipleship and true discipleship may appear to be the same, but ‘you will know them by their fruits’ (Matthew 7:16, from the Sermon on the Mount). The ears on the real wheat are so heavy it makes the entire plant droop downward, but L. temulentum, whose ears are light, stands up straight. True fruitfulness comes with the heaviness of the Cross. False fruitfulness is unbent by suffering and sacrifice, because it is not united with Christ on His Cross. The wheat will also appear brown when ripe, whereas the darnel is black. One can probably stretch by making some point about true discipleship only being darkened by the lesser dark of venial sin, whereas false discipleship is corrupted by the utter darkness of mortal sin, but I think I’d rather just use the two images to show the contrast – since wheat isn’t really brown, but gold. It’s the colour of the Sun (of Justice, the Royal Son of the Father) and the Kingdom (gold), versus the colour of corruption and death (black). When the Lolium matures, the spikelets turn edgeways to the rachis, where the wheat spikelets remain as they grew previously. True discipleship stays on the straight path, whereas false discipleship causes a person to grow sideways, to become bent. So it’s a parable not just about the Church not being able to separate herself from false followers of Christ, but also not being able for certain exactly who they are, until the final Judgement when all people’s fruits will become clear. The healthy fruits lead to life, the poisonous fruits to death – not only in terms of the righteous receiving life, and the damned receiving death, as in the harvest of the parable, but also in terms of those who eat those people’s fruits. In Communion, we eat the Body and Blood of Christ, and become one with each other through the eating. If we commune with Christ in sincerity, we eat unto life. If we commune falsely, we eat unto death. And if we are united to death, we bring death to those who are joined with us. Whereas if we are united to life, we bring life to those who are joined with us. Thanks be to God for His Son Jesus Christ, who brings life out of our death.